This list of most valuable half dollars includes many pieces from the 19th century, which was a time when the denomination represented a huge chunk of a day’s wages. Back in those days, the half dollar was a coin that often saw heavy usage – a situation quite opposite from today. Half dollars are not commonly encountered much anymore. Once a staple of U.S. currency, the 50-cent piece has become something of a novelty in recent decades. One reason this may be the case has to do with the advent of the Kennedy Half Dollar, which was first struck in 1964 in honor of the beloved 35th president John F. Kennedy, who was assassinated on November 22, 1963. Millions of people saved the 1964 Kennedy Half Dollar to the point that the coin became scarce in circulation. Over time, Americans became accustomed to saving half dollars so it became more of a novelty worthy of saving rather than spending. The half dollars in this list are generally from the Bust and Seated Liberty coin series, which have multiple scarce dates and are in high demand by coin collectors. Only one coin among the Top 10 most valuable half dollars was made in the 20th century, and several among the top represent the Draped Bust half dollars from the turn of the 19th century. One piece among the Top 10 most valuable half dollars is the 1794 Flowing Hair half dollar – the first official 50 cent piece ever made by the U.S. Mint. All of the coin values listed below are for pieces grading Good-4 on the Sheldon Grading Scale, unless otherwise noted. All of coins without mint marks were minted at the Philadelphia Mint. 1838-O Proof Capped Bust Half Dollar: $250,000 – Only 20 1838-O half dollars were made, and they were all struck as proof coins. This Capped Bust half dollar circulated for a time, and the remaining 1838-O specimens are found in circulated grades, with the astronomical price listed here for an Extremely Fine-40 Grade example. The “O” mint mark is for the New Orleans Mint which was open from 1838 to 1861 then again from 1879 to 1909. 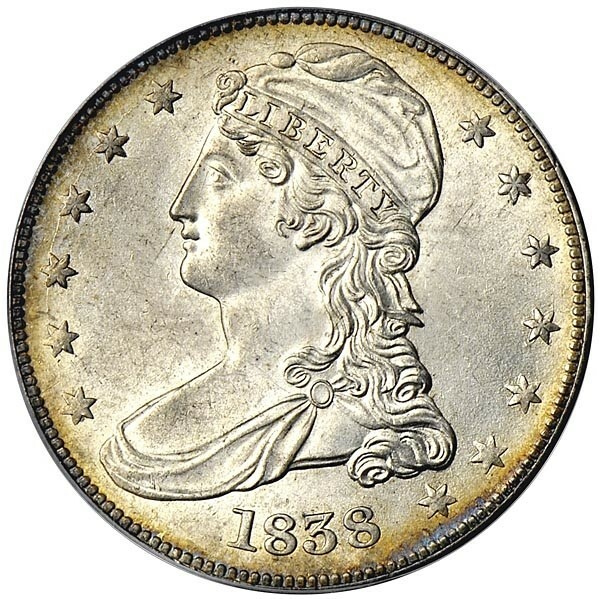 1817/4 Capped Bust Half Dollar: $60,000 – It’s safe to say that few type coin collectors would ever think of shelling out 60 grand to buy an example of the rare 1817/4 half dollar in the mere grade of Good-4, but this coin to Bust half dollar collectors is a cherished treasure that is one of several dozen interesting varieties in the series. 1796 16 obverse stars Draped Bust Half Dollar: $39,500 – Among the tiny mintage of just 3,918 for all 1796 half dollar was the 16 stars obverse Draped Bust Half Dollar. To accommodate a growing nation, stars were often added to retooled dies to properly represent the number of states in the Union, which added Tennessee in 1796. 1797 Draped Bust Half Dollar: $36,700 – All the early half dollars are rare, and the 1797 half dollar is no exception. In fact, the 1797 half dollar mintage is incorporated into the 3,918 mintage figure associated with the 1796 half dollar. Few 1797 half dollars exist, so one in any condition is a numismatic prize to be treasured. 1796 15 obverse stars Draped Bust Half Dollar: $36,500 – Minted before Tennessee joined the Union on June 1, 1796, the 15 star obverse variety is rare simply because it’s among the early half dollars, of which few were minted. The number of 15-star obverse half dollars is included in the overall mintage of 1796 halves, which stood at 3,918. Remember, the number of surviving pieces is tiny. In fact, it’s believed that less than 10 percent of all Draped Bust Half Dollars from 1796 and 1797 still exist in total, across all grades. 1878-S Liberty Seated Half Dollar: $28,500 – Of the 12,000 half dollars struck in 1878 at the San Francisco Mint, perhaps only 60 still exist today across all grades. Many were melted, and many others were simply worn down beyond recognition or otherwise lost to the effects of time. 1806 knobbed stem through claw Draped Bust Half Dollar: $20,000 – As we know, not many numismatists pay much attention to collecting the early varieties as they are simply to expensive to collect. But for those who do want examples of the early die variations, the 1806 knobbed stem through claw Draped Bust Half Dollar is worth a princely sum indeed. Very few survive today. 1794 Flowing Hair Half Dollar: $2,850 – It may be surprising to some that the first half dollar ever made barely even clinched a spot among the Top 10 most valuable half dollars, but here it is in 9th place, at least in terms of its price in a grade of Good-4. While extremely rare, a 1794 half dollar is a coin that thankfully survives in large enough numbers to satisfy the demands of a several hundred numismatists or so at any one time. 1892-O micro “O” Barber Half Dollar: $2,250 – A Barber coin rounds out this list of the 10 most valuable half dollars. The micro “O” half dollar variety does enjoy a large amount of attention from the numismatic community, especially as the Barber Half Dollar series is widely collected by date and mint mark, placing much demand on a coin with relatively little supply. The “O” mint mark is for the New Orleans Mint which was open from 1838 to 1861 then again from 1879 to 1909. What follows are the 11th through 25th most valuable half dollars, which are all listed at prices corresponding to a grade of Good-4.